MRU - Single Beveled Edge Brush Diamond Gold Wedding Band Admired by brides and grooms for its sleek styling and impeccable attention to detail, this Single Bevelled Edge Brush Diamond Gold Wedding Band will make a timeless addition to any jewellery collection. Available in white and yellow gold options, it features a single bevelled edge with a high polish shine, brush detailing, and a round gypsy set diamond with a total carat weight of 0.05ct. Various widths and 10kt, 14kt and 18kt gold available. Admired by brides and grooms for its sleek styling and impeccable attention to detail, this Single Bevelled Edge Brush Diamond Gold Wedding Band will make a timeless addition to any jewellery collection. Available in white and yellow gold options, it features a single bevelled edge with a high polish shine, brush detailing, and a round gypsy set diamond with a total carat weight of 0.05ct. 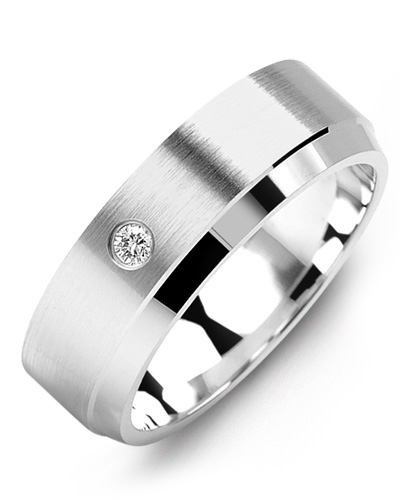 Various widths and 10kt, 14kt and 18kt gold available.